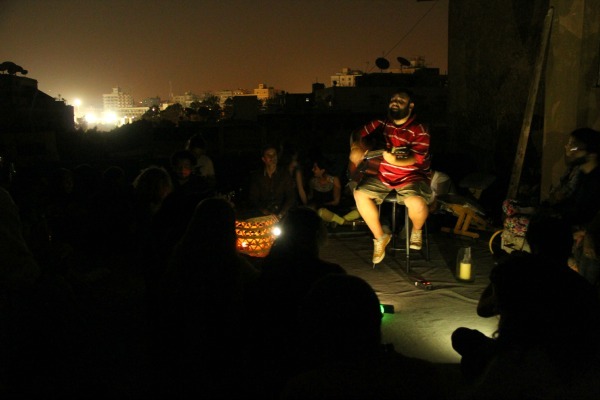 Cairo hosts its first ever Sofar concert, part of a global movement that brings live music to people’s living rooms — Published in Ahram Online. Cairo’s underground music scene just got a little more alternative. Music fans may be used to catching their favourite bands in theatres, bars and at festivals; but a group of young people are working to change that, by bringing musicians and fans together in a living room in a quiet district of Cairo, for a new kind of gig. On Tuesday, the capital hosted its very first ‘Songs from a Room’ (Sofar), part of a global music movement which started in London in 2009 and has since spread to more than 80 cities around the world. 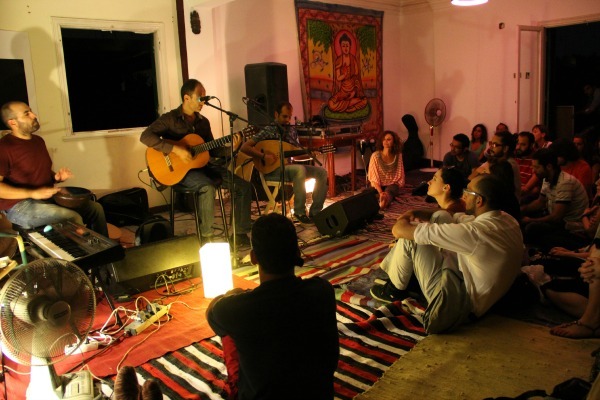 Sofar Cairo hosted four acts, starting with the acoustics of oriental blues by Jordanian Hisham Said and Mohamed. They were followed by Hany Mostafa and his band, who took the mood up a notch with a stellar performance of indie/pop music. Safi then took his guitar to the rooftop and with his soulful voice played his songs, before Abdalla Meniawy and Ahmed Saleh closed the line-up with their electro-spoken word project. Sofar’s concept is simple: the location is secret, and so is the line-up. However, the main information platform for all Sofar’s activities is the website, to which music fans sign up. The subscribers are only aware of the date of the concert, and one night before the event they receive an email with the location. The line-up remains a surprise, with the aim being that fans come for the experience. The same procedure was implemented for Sofar Cairo, with fans being informed about the location, a spacious house in Maadi with a rooftop. A few important rules assure that the experience does not turn into a house party with people socialising while musicians play in the background, the most important of which is that when a musician is performing, everyone has to sit silently and give them their undivided attention. While the event is free of charge, a hat is passed around for donations to help keep the movement running. The movement was started by Rafe Offer, Rocky Start and Dave Alexander in London. The trio were disappointed with the music scene in London, where amazing bands would be performing in a crowded bar with people chatting and not paying attention. So they hosted a concert following this concept in a living room and it all took off from there. Five years and 83 cities later, Sofar Cairo was attended by a mixed crowd, with familiar faces from what could be classed as the city’s hippie community and the music-lovers who frequent Cairo’s independent music concerts and festivals. The mood was calm yet festive, and the audience were willing to put up with a few challenges such as the heat, a power cut which lasted for more than an hour, and technical glitches that occurred during Meniawy and Saleh’s performance. According to Nora El-Fangary, a member of the team organising Sofar Cairo, they plan on hosting several more of the events, each time in a new location. Their next show will probably be after Ramadan, which starts in less than two weeks. El-Fangary and the rest of the team came together because of their passion for live music and their willingness to present a new kind of space for the scene to grow. When Loulii Megahed, a DJ and another member of the team, attended one of the Sofar gigs in New York, she saw the potential for the Cairo crowd. Another important element of Sofar is that the night is documented via sound and video, so the global Sofar community can have access to the talent presented in living rooms around the world. When a user registers on the Sofar website, they can get access not only to the gigs happening in their city, but if they are travelling can connect with others from the Sofar community and attend living room gigs anywhere in the world. To be part of the Sofar community register here and find Sofar videos documenting the events around the world here.